One of the most rewarding aspects of building a successful organization lies in having an opportunity to recognize excellence. Over the years, AWNA has co-operated with other Alberta industry partners or initiated by itself, a number of successful awards, recognition programs and scholarships. The fact that these activities have consistently proved useful to individuals and our membership, is testimony to their value. The Central Office plays a participatory role on behalf of the membership and the industry by advertising and informing interested parties of the opportunities available. It processes all applications, dispenses selection and criteria information, and arranges presentation and documentation on behalf of the Association. General information on what is currently available follows. 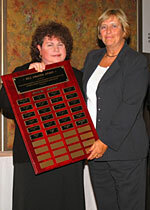 George Meyer Leadership Award Recognizing a newspaper staff member or publisher who exemplifies community volunteerism. A long-standing tradition of recognizing photographic excellence among Alberta's weekly newspapers, Canada's Energy Citizens Photographic Awards are divided into the six categories. 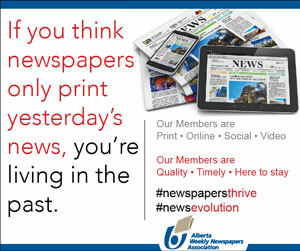 The Alberta Weekly Newspapers Association encourages excellence by sponsoring an annual provincial competition to celebrate the achievements of its member newspapers. Newspapers compete against other newspapers of similar circulation for special awards. This annual competition honours general excellence in Alberta weekly newspaper publishing. Six different categories are based on circulation, from under 1100 up to 12,500 and over. In each of these groups, awards are then presented for excellence. The Bill Draayer Award was established in 1983 and has since become the premier award honouring members who have made a considerable investment of their time, energy and ideas for the betterment of the AWNA.